No self-respecting ice cream parlour would be complete without a delectable family secret recipe. Nardini Cafe is one of Scotland’s most loved, whether we know exactly how they make the delicious stuff or not. It first set up shop in 1935 on the seafront in Largs and fortunately for us, turned up on Byres Road last March. 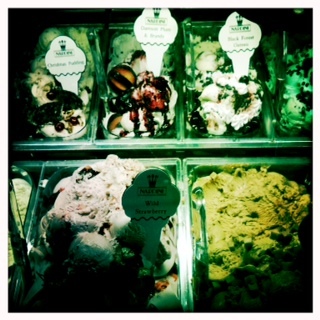 Art deco design coupled with gorgeous ice creams like After Eight Mint to Ferrero Rocher – what’s not to love? In addition to charming design and tasty ice cream, Nardini offers up pastries and the most must-have gooey good chocolate and beetroot cake. We opt for an ice cream sundae – a first for my kids who are beside themselves with joy, although admittedly I have to gently put them off the Clyde Coast Extravaganza with 12 scoops of ice cream and 16 toppings. Their Raspberry Snowball Delight and Hot Fudge Nutty Nut Sundae do the trick and are still impressively huge with three scoops of ice cream, lashings of special sauces, whipped cream frenzy and snowballs and nuts. Nardini’s vast menu is chocked full of choice. And possibly just as thrilling for my boys – you can watch your glorious ice cream dream being created. Prepare for a challenge as you will need to literally power your way through the layers of ice cream and toppings – and only the mighty expanding stomachs triumph. The sundaes are lavish and a bit more expensive at £6.95 or £7.95 a pop. However, one between two would be perfectly fine. They also have a children’s section on the menu -which we managed to miss – at £4.25 a sundae. If the Sundaes are simply too overwhelming, you can always enjoy single or double scoop bliss. So go on, treat yourself to some the best ice cream in town. This entry was posted in Ice cream and tagged Best ice cream in Glasgow, eating in Glasgow, Glasgow ice cream, Nardini Cafe Glasgow, what to do in Glasgow. Bookmark the permalink.